The Forest Campfire quilt block is an easy nine patch block containing one of my favourite patches - flying geese units. Secondly, it features three quarter square triangle patches, so named as the patch contains three triangles filling up a square. The unit itself is made using both half square triangles and quarter square triangles. 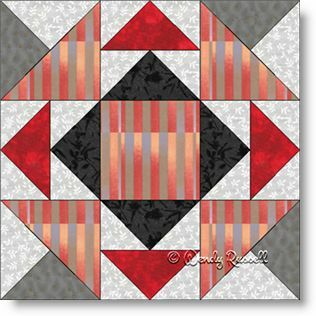 The sample quilts illustrated feature blocks set side by side as well as on point with sashing to give two totally different looks in the end.